Mar chuid den fheachtas Carghais ag Trócaire i mbliana, tá an charthanacht ag díriú airde ar dhrochthionchar an athrú aeráide atá le sonrú cheana féin i gcuid de na tíortha is boichte ar domhan, an Aetóip ach go háirithe. D’fhoilsigh Trócaire tuairisc tamall beag ó shin faoin teideal Feeling the Heat, a chuir roinnt cás-staidéar chun cinn ó thíortha atá i mbéal forbartha – an Aetóip, Hondúras, an Chéinia, an Mhaláiv agus na hOileáin Fhilipíneacha. Bíodh is go bhfuil astaíocht dé-ocsaíde carbóin (CO2) na dtíortha seo thar a bheith íseal, is mó atá tíortha mar seo ag fulaingt mar gheall ar an uafás astaíochta atá ag teacht ó na tíortha forbartha – Éire san áireamh. Agus muid ag tabhairt aghaidh ar na dúshláin seo bhí leid ar cheann de na constaicí is mó os ár gcomhair le feiceáil an tseachtain seo caite ar chósta Mhaigh Eo. Thángthas ar phíopa 800 slat ar fad agus é ar snámh sa chuan agus tugtar le fios gur mar gheall ar drochaimsir le déanaí a bhris sé ón áit a raibh sé suite ar ghrinneall na farraige. D’fhiafraigh iascairí áitiúla den Ghníomhaireacht um Chaomhnú Comhshaoil cén fáth nach raibh siad ag déanamh iniúchadh ar an chás, agus d’fhreagair an EPA go raibh siad ag fáil an eolais is déanaí ón chomhlacht. Shell an comhlacht atá i gceist agus an tionscadal conspóideach Corrib Gas atá idir chamáin. Ba é imní faoi chúrsaí sláinte do dhaoine agus don timpeallacht a chuir tús leis an chonspóid faoin tionscadal seo in Iorras Mhaigh Eo. Conspóid atá ag leanúint leis le cúig bliana déag anuas. Ábhar eile conspóide ná na coinníollacha breá cánach a fuair Shell (agus comhlachtaí ola agus gáis nach iad) chomh maith leis an fhabhar a fuair an ollchomhlacht ón stát thar an phobal iad féin. Is sainmhíniú amháin é sin ar an nua-liobrálachas – an gean atá ag lucht chumhachta do chorporáidí seachas do dhaoine – agus is é an córas seo is mó a bhfuil dár mbrú i dtreo tubaiste timpeallachta. Faoin idé-eolaíocht seo cúlaíonn an stát ó aon chur isteach ó cheart an lucht rachmais le dul sa tóir ar bhrabús – is cuma cén dochar a dhéanann sé. Agus níl mórán tionscal atá chomh brabúsach le tionscadal na mbreoslaí iontaise. Caithfidh na comhlachtaí móra fanacht brabúsach ar ndóigh, agus mar thoradh air sin tchíonn muid go bhfuil siad ag dul amach ag lorg gach deor deiridh ar féidir leo aimsiú ag úsáid modhanna eastósctha neamhghnácha – scoilteadh hiodrálach, mianadóireacht slocoscailte, mianadóireacht tarraghainimh, srl. Tá na modhanna seo ag déanamh tuilleadh dochar ó thaobh na haeráide de, ní amháin mar gheall ar astaíocht CO2 ach na ceimicí eile cosúil le meatán atá níos measa don téamh domhanda. Cuidíonn an t-ollbhrabús leis an stocaireacht a dhéanann an tionscal le rialtais agus le polaiteoirí ar fud na cruinne. Tá an nua-liobrálachas i réim leis na maithe móra ach ní hionann sin is a rá go bhfuil amhlaidh don choitiantacht, don slua salach, do na gnáthdhaoine – agus daonlathas in ainms bheith againn dár ndóigh. Sna Stáit Aontaithe mar shampla, le linn toghchán 2012 chaith an tionscal ola agus gáis $73 milliún i ndeonacháin agus in 2013 chaith siad $400,00 sa lá ar stocaireacht le Comhdháil na Stát Aontaithe agus oifigigh rialtais. Tá tionchar eile ag córas an mhargaidh shaor. Mar gheall ar na buntáistí cánach flaithiúla a fhaigheann na comhlachtaí móra, caithfidh an chuid eile againn maireachtáil faoi pholasaí déine. Maidir leis an timpeallacht, tá tionchar na déine le sonrú anseo go háitiúil. Mhaígh Translink ar na mallaibh go mbeadh orthu roinnt seirbhísí bus a ghearradh agus praghasanna a ardú. Cuir san áireamh gur ábhar magaidh iad na lánaí rothair agus tchíonn tú go bhfuil daoine á mbrú le tiomáint ina ngluaisteáin féin nuair a ba chóir córas ceart iompar poiblí bheith againn, go háirithe i gceantair thuaithe. Tá bealaí éagsúla ann do ghnáthdhaoine athrú beag a dhéanamh ina saol féin atá ar leas an domhain seo (agus ná déanaimis dearmad nach bhfuil aon áit eile againn le dul). Tá moltaí le fáil ó Trócaire agus ón iliomad grúpa eile. Ach má tá muid chun stop a chur leis an tubaiste atá os ár gcomhair mar gheall ar athrú aeráide, is é athrú córais an t-aon bhealach a bhainfidh muid sin amach. As na lochtanna ar fad a bhí ar chlár Spotlight faoin Ghaeilge (agus is iomaí locht a bhí ann) bhí easnamh mór amháin ann ar mhaith liom aird a dhíriú air, agus is é sin an dóigh ar caitheadh leis an teanga agus a pobal labhartha faoin stát Oráisteach. In 1920 chinn Rialtas na Breataine ar chríochdheighilt a fhorchur ar Éirinn. Sna Sé Chontae, thóg na haontachtóirí stát aon-pháirtí a rinne dian-iarracht a cheangal leis an Breatain a dhaingniú agus gach gné Éireannach den limistéar a chur faoi chois. Ag am na críochdheighilte bhí mionGhaeltachtaí go fóill scaipthe ar fud an stáit. Diúltaíodh go raibh a leithéid de theanga agus de phobal teanga ann, ag dul chomh fada le tagairtí don Ghaeilge a stróiceadh ó dhaonáireamh 1921 ar aghaidh. Bhí an cur chuige seo le sonrú sa chóras oideachais ón chéad lá. Rinne an chéad aire oideachais, an Tiarna Londonderry, rinne sé cinnte go gcuirfí teorainneacha agus lancaisí ar na deiseanna leis an Gaeilge a fhoghlaim. D’éirigh go maith leis an pholasaí s’aige agus idir 1924 agus 1927 bhí laghdú 50% ar líon na ndaltaí ag dul don Ghaeilge. Lean gach aire oideachais eile leis an pholasaí. Taobh amuigh den chóras oideachais bhí sé le feiceáil go raibh polasaí beartaithe ann gan aon aitheantas a thabhairt don teanga ná don chultúr Gaelach. 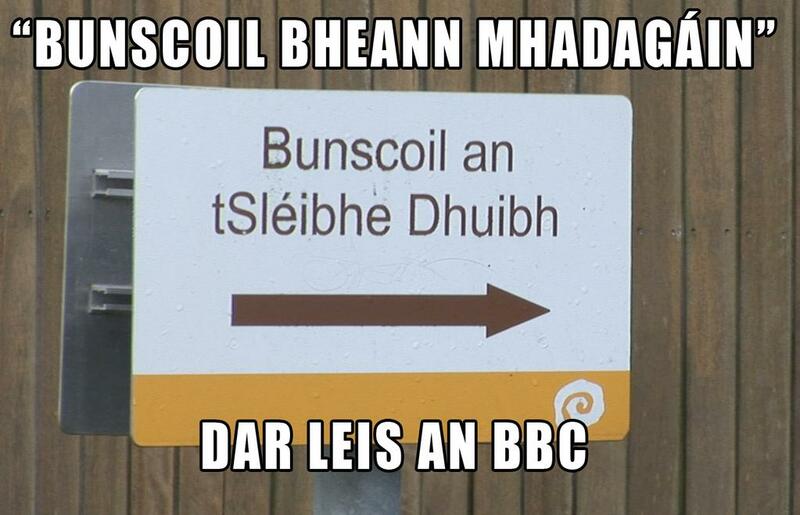 Ó thaobh chúrsaí craolacháin de, baineadh úsáid as monaplacht an BBC sa raidió agus ní ba mhóille ar an teilifís chun sochair don stát. Ní dhearnadh tuairisciú ar chluichí Gaelacha ar feadh i bhfad, agus mhair cosc ar chraoladh i nGaeilge go dtí na 1980í. I mí Lúnasa 1945 labhair an feisire náisiúnach Eddie McAteer cúpla focal Gaeilge sa pharlaimint agus thosaigh polaiteoirí aontachtacha ag scairteadh “No foreign language here ” – an Príomh-Aire Basil Brooke agus an t-aire oideachais An Leifteanant-Choirnéal Samuel Hall-Thompson ina measc. In 1949 rinne an feisire Brian Faulkner (a bheadh ina Phríomh-Aire níos moille) gearán sa Pharlaimint go raibh comhairle in Iúr Cinn Trá ag iarraidh sráideanna a ainmniú i nGaeilge, “in a language which is not our language”, agus as a shiocair cuireadh leasú leis an Acht um Shláinte Phoiblí agus Rialtas Áitiúil a chuir cosc iomlán ar shráidainmneacha Gaeilge. Sna blianta beaga ina dhiaidh ritheadh an tAcht um Ord Poiblí agus an tAcht um (Thaispeáint) Bhratacha agus Suaitheantais, a neartaigh an tAcht um Chumhachtaí Speisialta agus a shéan go raibh spás ann d’aon chuid de chultúr na hÉireann arís eile. Níl anseo ach sracfhéachaint ar na bealaí a chaith an Stát Oráisteach leis an Ghaeilge agus le pobal na Gaeilge. D’ainneoin na bhfiarthaí ar fad a rinne an BBC ar an scéal, ní féidir an milleán as naimhdeas aontachtach don teanga a chur ar phoblachtóirí a rinne ‘polaitiú’ ar an teanga, in 1981 nó 1916 nó pé am eile. Sna 1970í rinne paraimíleataigh aontachtacha roinnt ionsaithe gunna agus buamála ar Roinn na Gaeilge san Ollscoil chéanna. Dá mhéad a d’athraigh cúrsáí le céad bliain anuas, is amhlaidh is beag a d’athraigh siad. Caithfear fáilte a chur roimh chinneadh rialtas na Sé Chontae Fichead cás ‘fhir na gcochall’ a thabhairt os comhair na Cúirte Eorpaí um Chearta an Duine arís. I bhfómhar 1971, cuireadh imtheorannú gan triail i bhfeidhm sna Sé Chontae. Thug arm na Breataine ‘Operation Demetrius’ ar chéad laethanta an chórais seo, nuair a thóg siad 342 náisiúnach ar 9ú agus 10ú Lúnasa na bliana sin. Taobh le Demetrius bhí ‘Operation Calaba’ ann chomh maith. Faoin obráid seo roghnaíodh grúpa beag de cheathrar fear déag – fir a bhí le bheith ina muca guine agus seirbhísí faisnéise na Breataine ag baint triail as na Cúig Theicníc orthu. Séard atá sna cúig theicníc ná díth bia agus dí; díth codlata; cochallú; torann bán; agus pointe struis ina cuirtear daoine ina seasamh in éadan balla le géaga sínte. I dtaca leis an chochallú de, rinneadh bagairt ar chuid de na fir go raibh siad le bheith caite amach as ingearán. I roinnt cásanna rinneadh amhlaidh agus an t-ingearán díreach cúpla troigh os cionn na talún. Tuigtear go rí-mhaith go bhfuil tionchar uafásach aigneolaíoch ag díth chéadfach den chineál seo. Ag deireadh 1971 thóg rialtas na Sé Chontae Fichead cás thar ceann na bhfear in éadan na Breataine ag an Choimisiún Eorpach um Chearta an Duine. Ba é seo an chéad uair a thóg stát amháin cás in éadan stát eile ag an Choimisiún. Se deireadh mhaígh an Coimisiún gurbh ionann na cúig theicníc agus céasadh. Rinne rialtas na Breataine achomharc ar an chinneadh agus in 1978 ghlac an Chúirt Eorpach um Chearta an Duine leis nach céasadh a bhí ann, ach gur íde mhídhaonna agus tháireach a bhí ann. Tá fianaise taghta chun solais anois go ndearna rialtas na Breataine iarracht an Chúirt a chur amú, agus sin an fáth anois go bhfuil brú ann an cinneadh a rinne an Chúirt in 1978 a aisiompú. In 1972 d’fhógair príomhaire na Breataine Edward Heath nach n-úsaidfidís na cúig theicníc mar áis cheastóireachta as sin amach. In 1977 d’fhógair Ard-Aighne na Breataine Sam Silkin an rud céanna os comhair na Cúirte Eorpaí. Bhí siad ag iarraidh an dubh a chur ina gheal ar an phobal. Rinne rialtas na Breataine faoi Heath cinneadh rúnda leis na cúig theicníc a choinneáil ar an ábhar gur uirlis áisiúil faisnéise a bhí iontu dar leo. Bhí impleachtaí ní ba fhorleithne aige seo agus ag an rialú na Cúirte nach céasadh a bhí ann. Ní amháin gur lean an Bhreatain ar aghaidh ag úsáid na dteicnící ach theagasc said iad dá gcomhghleacaithe idirnáisiúnta freisin. Níos déanaí, in 2002 bhí na Stáit Aontaithe ag lorg bealaí le “teicnící treisithe ceastóireachta” a fhorbairt. De bhrí nárbh ionann na cúig teicníc agus céasadh faoi rialú na Cúirte Eorpaí, glacadh leis go raibh na teicnící úd ceart dlíthiúil go leor le húsáid ar na himeorannaithe i gCuan Guantanamo. In 2011, tharla fiosrúchán poiblí ar bhás Baha Mousa ón Iaráic in 2003 agus é faoi choiméad ag arm na Breataine. Tháinig sé amach le linn an fiosrúcháin go raibh na teicnící fós in úsáid acu. Má aithníonn an Chúirt Eoprach um Chearta an Duine amach anseo gur céasadh atá sna cúig teicníc, agus ba chóir dóibh, ní hionann sin is a rá go gcuirfear deireadh leis an droch-íde bhrúidiúil seo. Ciallóidh sé áfach go mbeidh sé níos deacra ag rialtais a leithéid de iompar a chosaint. Ciallóidh sé go mbeidh uirlis ag an chosmhuintir – bíodh siad i mBéal Feirste nó i mBasra – le cinntiú nach bhfuil na mórchumhachtaí impiriúlacha ábalta caitheamh leo gan baol pionóis. Seo iad cartlanna an ranga Uncategorized.